Unlike mass-market rivals General Motors Co. and Ford Motor Co., Toyota Motor Corp. posted a quarterly profit in Europe. The Japanese automaker reported a first-quarter operating profit of 3.4 billion yen (35.6 million euros) compared with a 7.55 billion yen (68.8 million euro) operating loss in Europe during the same period last year. At the time, Toyota was trying to rebound from natural disasters in Japan. While Toyota's business has improved in Europe, Senior Managing Officer Takahiko Ijichi said on Friday the automaker predicts the European car market will decline by 5 percent this year, leading to the fifth-straight year of shrinking volumes in the region. Toyota is less reliant on European demand than GM and Ford, making the Japanese carmaker less vulnerable to the region's debt crisis. GM lost $361 million in Europe during the quarter; Ford's second-quarter European loss of $404 million. Toyota said today in a statement that its quarterly net revenue rose 11 percent to 512 billion yen (5.3 billion euros) in Europe, where industry association ACEA is predicting the market to shrink to the lowest level since 1995. Europe's new-car registrations sales fell 6 percent in the first half to 6,896,348. Overall, Toyota Motor Corp. reported a big increase in first-quarter profit and raised its vehicle sales forecast on demand for its cars in North America and Japan. 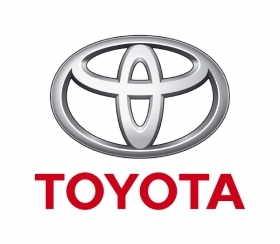 Toyota's overall net income increased to 290.3 billion yen (3 billion euros) in the three months ended June 30, from 1.16 billion yen a year earlier, the company said. Profit climbed to the highest level in four years. The automaker said vehicle sales at its Toyota, Daihatsu and Hino brands would increase to 9.76 million from January to December, raising an earlier target of 9.58 million. Toyota, plagued by natural disasters in 2011, has outsold General Motors Co. and Volkswagen AG to lead the industry for two straight quarters. The company also projected production of 10.05 million units for the period. Operating profit from North America quadrupled to 117.6 billion yen from 28.9 billion yen a year earlier. The company, led by President Akio Toyoda, is now counting on the Prius and Camry to sustain earnings growth in the United States as analysts project demand to slow in Japan. "Toyota's business results for the first quarter were strong but we should keep in mind that the sales surge was aided by domestic subsidies and new cars like the Camry in the U.S.," said Koichi Sugimoto, a Tokyo-based auto analyst at BNP Paribas SA. "For the three quarters left this fiscal year, the biggest concern for Toyota should be currency rate." Toyota has gained 19 percent in Tokyo trading in 2012 and last closed at 3,065 yen before the latest earnings announcement. Still, the stock has surrendered about half of its gains since the end of March after the yen turned into the best-performing major currency from the worst performer within a quarter. Overall operating profit, or sales minus the cost of goods sold and administrative expenses, was 353.1 billion yen, beating the 316.2 billion yen average estimate. Revenue rose 60 percent to 5.5 trillion yen, compared with the 5.48 trillion yen average analyst estimate. In the United States, April-to-June deliveries increased 48 percent to 558,812 vehicles, helped by sales of the best-selling Camry sedans, Corolla compact sedans and Prius hybrids as Toyota led the Japanese auto industry's recovery from last year's production disruptions, according to data compiled by Bloomberg. In July, Toyota's U.S. sales rose 26 percent and the company is ahead of its full-year target of 15 percent growth. Industrywide sales of light vehicles in July grew 8.9 percent to 1.15 million units, according to researcher Autodata Corp. The improvement, buoyed by gains at Japanese carmakers, means the industry is headed for its biggest number of annual deliveries in five years. Toyota expects industrywide deliveries to reach about 14.3 million in the United States this year, and for "the momentum that was generated through the first six or seven months" to continue through the rest of this year, Bill Fay, group vice president of U.S. Toyota-brand sales, said this month. In July, Toyota led full-line automakers by reducing spending on discounts and promotions in the U.S. by 24 percent to $1,849 per vehicle, according to Autodata estimates. For the quarter ended June 30, it increased incentive spending 4.2 percent, according to Autodata. In Japan, Toyota's deliveries almost doubled last quarter, led by the Prius hybrid, as pent-up demand and government subsidies for fuel-efficient cars helped spur demand. The Japanese market expanded 54 percent in the first six months of 2012, the fastest growth among the world's biggest automobile markets, according to data compiled by Bloomberg. Toyota generated profit from Japan for a second-straight quarter after posting eight consecutive quarters of losses. Operating profit at home was 107.1 billion yen, versus the 47.3 billion yen average analyst estimate. Growth in Japan may slow after the budget for government subsidies runs out as soon as this month, according to Sugimoto at BNP Paribas. That means Japanese carmakers will be under pressure to introduce new models and spend more on marketing the models to sustain demand, he said. Asian markets outside of Japan, including China and India, contributed 101.5 billion yen in operating income, compared with the 104.1 billion yen average analyst estimate. Total wholesale deliveries of passenger vehicles in China may rise 11 percent to 16.09 million units in 2012, according to the China Association of Automobile Manufacturers. Toyota kept its exchange-rate assumptions of 80 yen to the dollar, though it revised its assumption for the euro to 101 yen from an earlier 105 yen estimate.